Using myth, stories, dreams, and music, we will look at different forms of grief, which when experienced, accepted, and held in sacred space, leads to a return to life and praise. 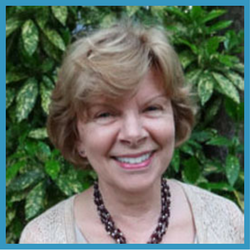 Anne Pickup, LCMFT is a licensed psychotherapist in D.C. and Maryland with a Masters Degree in Marriage and Family Therapy. She received her Diploma in Analytical Psychology from the C.G. Jung Institute of Los Angeles. She is a founding member of the C.G. Jung Study Center of California, past president of the Philadelphia Association of Jungian Analysts, and current president of the Jungian Analysts of the Washington Area. She is a member of the Inter-Regional Society of Jungian Analysts, and is secretary of the Kairos film project; preserving Jung.